The National Geographic Channel has been making a big investment in series television and in making its specials “special.” They have the benefit of being an old brand in a market where many competitors re-brand themselves every two years. Today, they presented information on some of their upcoming works, including February’s two-hour factual drama Killing Kennedy, based on Bill O’Reilly’s best-selling book, and series Inside Combat Rescue, following US Air Force battle medicine. Animals are still a major focus for them, of course, and the new features will include Spoiled Rotten Pets (pretty self-explanatory), The Incredible Dr. Pol (a house call-making vet), Leader of the Pack (a series that matches abandoned dogs with adoption candidates), and, of course, Alpha Dogs, which was a main focus later in the panel. Furthermore, a couple of competitive shows are coming our way, including Ultimate Survival: Alaska, where eight top outdoorsmen make their way through the brutal frontier, and Are You Tougher Than a Boy Scout?, which has adults go head-to-head with Scouts in various challenges, like using a commando line to cross a gorge. Campbell didn’t feel a lot of weight on his shoulders because the script was so brilliant and people were so passionate about doing this in the right way. 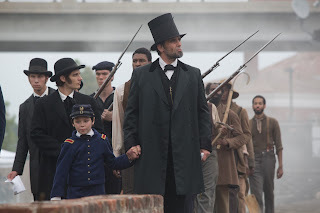 On filming the assassination scene, Johnson noted that “everyone knew what they were doing and there was a solemn work ethic that took over that night.” There was also excruciating attention to detail. And, a fact that I found fascinating and was surprised I did not previously know: Before Lincoln’s assassination, the White House doors were never locked. You could come in and wait and talk to the President!